While Friday’s decision did not establish new precedent, or extend beyond Massachusetts, advocates on both sides of the gun-control debate said it could have broad ramifications. Supporters of stronger gun-control measures, who are lobbying to make assault weapons illegal across the country following a series of mass shootings, hailed it as a powerful declaration that such bans are legal. Gun-rights activists, meanwhile, said the ruling could give attorneys general far too much power to interpret laws in ways that conform to their own beliefs. “We’re not going to give one person supreme authority to do whatever they want about any law, not just this law,” said Jim Wallace, executive director of the Gun Owners’ Action League of Massachusetts, an affiliate of the National Rifle Association and a plaintiff in the suit. Wallace said the plaintiffs, who include a group of gun retailers, had not decided whether to appeal the ruling. “As long as politicians and judicial officials continue to flout the law in order to advance a political agenda, the five million members of the NRA will be here to hold them accountable,” the statement read. In his ruling, Young also upheld Healey’s 2016 decision to notify gun sellers and manufacturers that the state would be “cracking down” on the illegal sale of assault weapons, including firearms that had been altered slightly to sidestep the ban. Healey sent out that notice in July 2016, a month after a gunman killed 49 people in an Orlando nightclub with a semiautomatic rifle and pistol. The order redefined copycats as those with operating systems essentially similar to those of banned weapons or components that are interchangeable with banned guns. On Friday, Healey said Young’s decision was a victory for Massachusetts. The lawsuit was filed in January 2017 in response to Healey’s notice to gun manufacturers, but the suit also challenged the state’s 1998 ban. The state ban was enacted four years after a federal ban was enacted. The Massachusetts law was written to reflect the federal statute and the state Legislature made it permanent in 2004, when the federal ban expired. 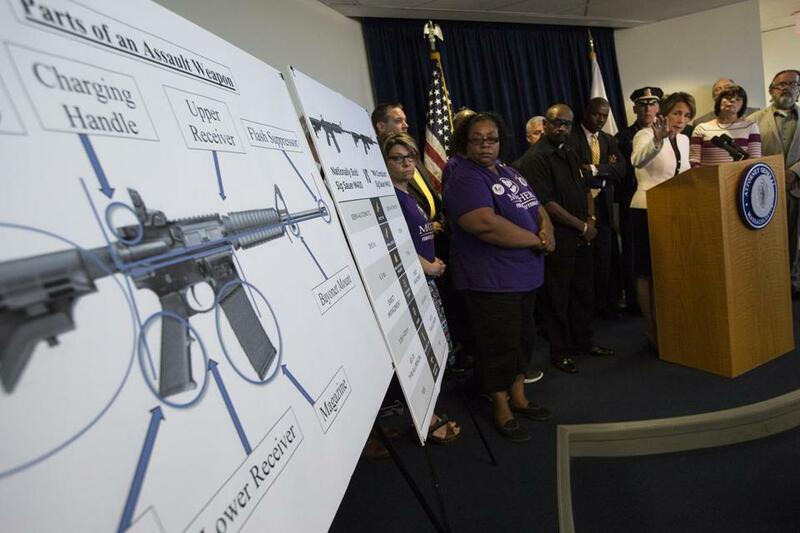 In their lawsuit, gun retailers and advocates argued that the AR-15 rifle, which is banned in Massachusetts, should not be seen as a military-style assault weapon, like the M-16 rifle, because it cannot fire in fully automatic mode. But Young ruled that its design makes the weapon adaptable for military and law enforcement purposes. “Simply put, AR-15-type rifles are ‘like’ M16 rifles, and fall outside the scope of the Second Amendment,” Young said. The lawsuit challenged Healey’s enforcement notice on the grounds that it could make people who bought duplicate guns before July 2016 vulnerable to prosecution and that it failed to define clearly which guns would be considered duplicates of the AR-15. But Young ruled that Healey disavowed her decision to enforce the notice retroactively and provided clarity on which firearms were prohibited. Dave Workman, senior editor of thegunmag.com, the official magazine of the Second Amendment Foundation, said Young’s ruling failed to take into account the popularity of the AR-15, a top-selling rifle. Healey still faces a separate lawsuit in Worcester federal court that challenges the 2016 enforcement notice. In that case, Judge Timothy S. Hillman agreed with gun retailers that her order was not clear enough and that there was “a plausible claim” that Healey’s move deprived gun owners of their property — the ability to sell duplicate weapons — without due process. “Plaintiffs complain that they now refrain from selling such weapons because such sales might be, but are not definitively, illegal,” Hillman wrote. Maria Cramer can be reached at mcramer@globe.com. Joshua Miller of the Globe staff contributed to this report.